Freshman midfielder, Bailey Bradford (right) and fellow teammate Obioma Onejeme work together to keep the ball in CRC's possession. The Hawks lost 2-1 on Sept. 11 to the Wolverines and were on the defensive for most of the game. 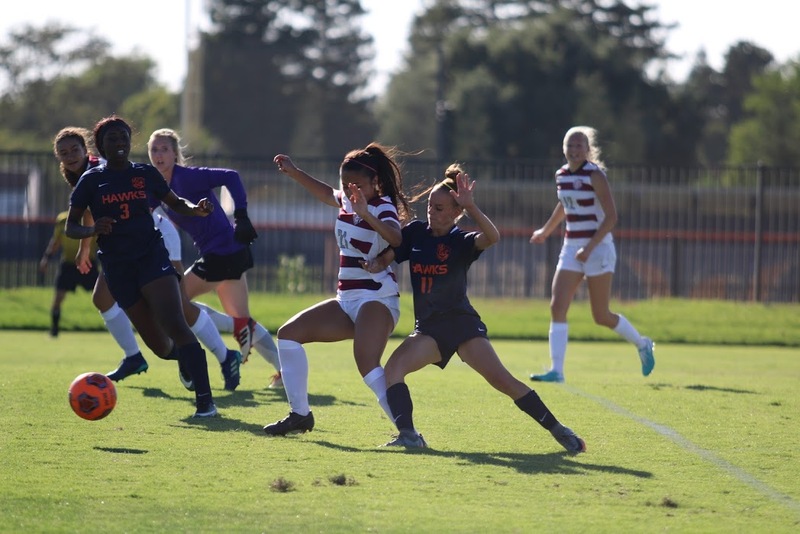 The Cosumnes River College women’s soccer team played Sierra College on Sept. 11 and lost 2-1. The Wolverines dominated the possession of the ball for the majority of the game and had the Hawks on the defensive. Despite the Hawks being on the defensive, they were able to get control of the ball, breaking through the Wolverines’ defense and scoring the first goal. “That was definitely exciting and we had so much momentum after scoring that goal,” said sophomore forward Alexandria Torres. The first goal was scored by freshman forward Obioma Onejeme whose first shot bounced off the post but she quickly got the ball back and scored on her second attempt. “That’s what we needed to get to help us maintain a good mindset and keep the energy up,” said freshman defender Evelina Fedchuk. Sierra went back to dominating the ball but were unable to score until the closing minutes of the first half when sophomore forward Christina Kanellou scored. In the second half it was much more of the same, the Wolverines dominated the ball while the Hawks were on the defensive. The Wolverines got plenty of shots on goal but were unable to actually score, leaving the score at 1-1 most of the second half. It wasn’t until the 90th minute when sophomore center Samantha Craig scored the goal to put the Wolverines ahead by one. The Hawks got the ball onto their side and had a chance to score but were unable to convert, leaving the score 2-1 and the Wolverines getting the win. Despite the loss, the team and Coach Anguiano were optimistic about how they played and how they will play in the future.